NEBR: R.Burkhead 16-69; A.Abdullah 14-50; B.Heard 4-46; T.Martinez 16-41; TEAM 3-minus 6. 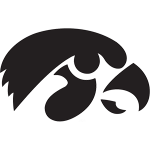 IOWA: M.Weisman 29-91; G.Garmon 5-19; J.Vandenberg 5-minus 2. NEBR: B.Cotton 3-39; Q.Enunwa 2-8; S.Osborne 1-7; R.Burkhead 1-6; A.Abdullah 1-3. IOWA: C.Fiedorowicz 6-56; K.Martin-Manley 3-19; K.Davis 1-11; H.Krieger Coble 1-6. 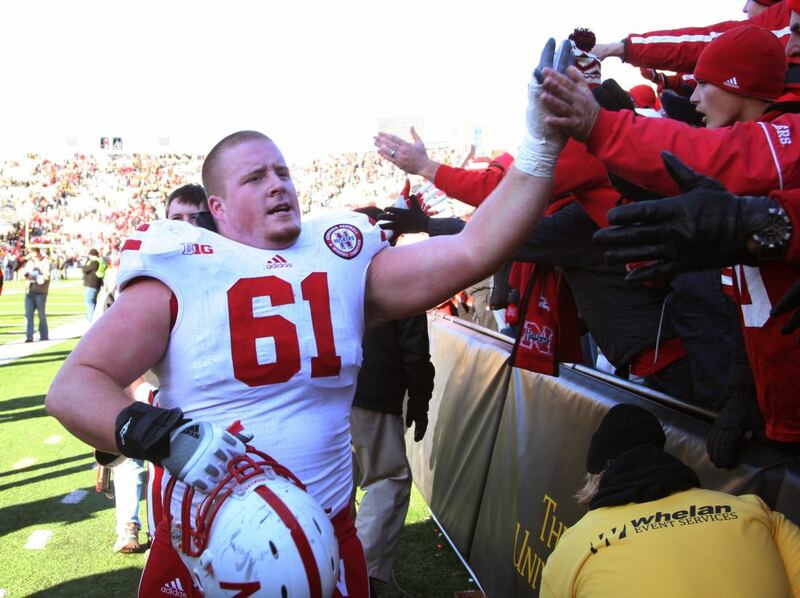 Spencer Long high-fives fans after the game. Huskers Punch Ticket to Indy: Nebraska used a stifling defense and a punishing running game to down Iowa and clinch a spot in the Big Ten title game in Indianapolis. NU’s seniors shined, as Alonzo Whaley and Eric Martin had career afternoons on defense. I-back Rex Burkhead made his return in the second half after missing the last four games, rushing for 69 yards and scoring the winning TD. 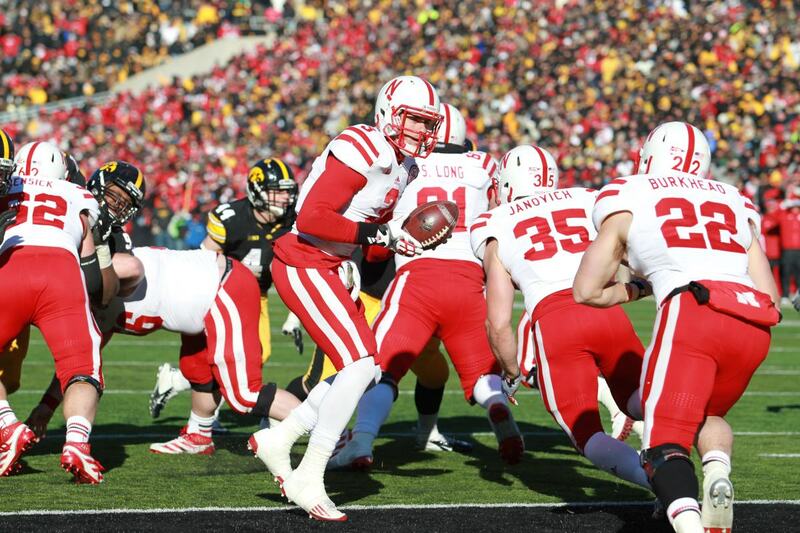 For the fifth time this season, Nebraska rallied from a second-half deficit to win. 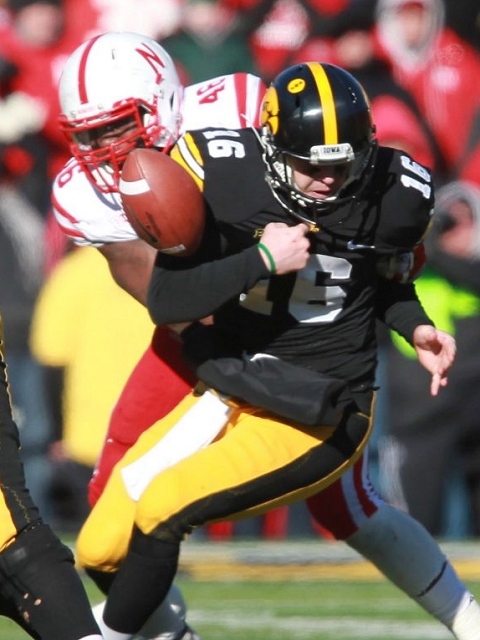 Just how mentally – and physically – tough the Blackshirts have become will be tested Dec. 1. It was the second half running of Burkhead that will be remembered most. In some ways it reminded me of Nebraska’s 13-3 win at Oklahoma in 1994 against a 6-6 Sooner squad. The Hawkeyes played extremely hard, and the weather conditions were a great equalizer. Let’s tip a stocking cap to a well-rounded outfit that is determined to help boost Nebraska to its previous elite stature. The game ripped open the same scab on offense that’s been bleeding throughout the season. This year’s Hawkeye offense fell off a football cliff. From division champ to conference champ, it’s like jumping over a canyon. Coaches in all sports sell either hope or results. Ferentz has neither right now. The already impossibly large legend of Rex Burkhead grew again. 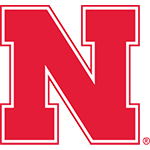 The Huskers are not a national title contender. They aren’t even in the Top 10. But dangit, they fight.